For the bride-to-be who is always one step ahead of the fashion curve, you need a ring that speaks to her extraordinary sense of style. Only the best will do, so select a ring that raises the bar. A breathtaking black diamond engagement ring like this one is perfect. Let her know she's the only one for you when you can't quite put your love for her into words. She'll shine wearing this 2.07 CTW Princess Black Diamond Halo Engagement Ring. 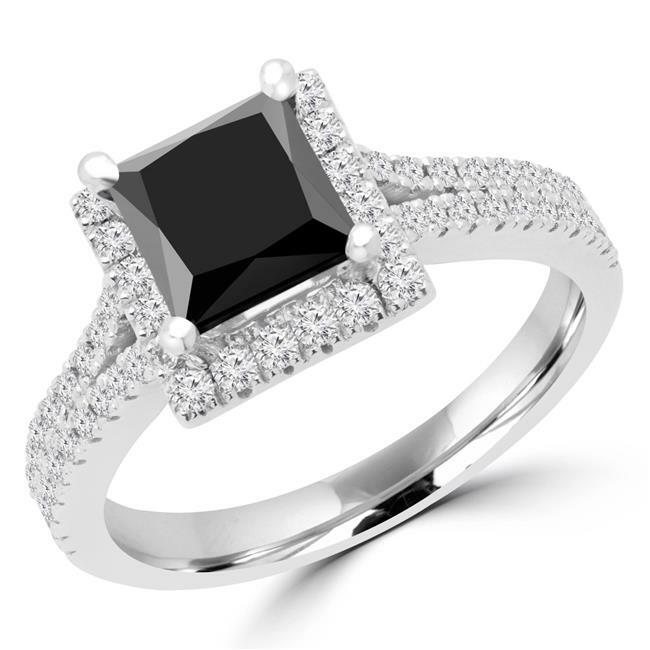 Set in lustrous 14K white gold, this spectacular ring features a triple AAA black princess-cut diamond at its center. Dazzling white diamonds provide head-turning sparkle surrounding the black diamond, and all along the ring's split shank. The diamonds have an F-G color range and VS1-VS2 clarity rating.